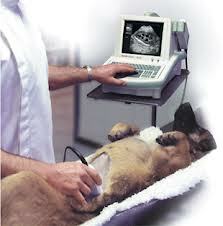 Granada Veterinary Clinic is pleased to offer in house abdominal ultrasounds at an affordable cost. An abdominal ultrasound is an advanced “non-invasive” diagnostic imaging test. When used in conjunction with other diagnostics, ultrasounding can help determine the underlying ailment for sick pets. An abdominal ultrasound is used to look at various organs like the liver, gallbladder, spleen, pancreas and kidneys. It is often used to help make a diagnosis such as foreign body obstruction’s, pancreatitis, abdominal masses, pyometra as well as early, non invasive pregnancy detection. If you have any further questions regarding Abdominal Ultrasounds please don’t hesitate to contact us or Book An Appointment for a consultation with one of our Veterinarians. If your pet needs more advanced or complex ultrasounding interventions, we re fer complex cases to a specialist.